Researchers from Keele University and an international team of astronomers have reported for the first time that a white dwarf and a brown dwarf collided in a 'blaze of glory' that was witnessed on Earth in 1670. Using the Atacama Large Millimeter/submillimeter Array (ALMA) in Chile, the astronomers found evidence that a white dwarf (the remains of a sun-like star at the end of its life) and a brown dwarf (a failed star without sufficient mass to sustain thermonuclear fusion) collided in a short-lived blaze of glory that was witnessed on Earth in 1670 as Nova Cygni—"a new star below the head of the Swan." It appeared abruptly as a star as bright as those in the plough, that gradually faded, reappeared, and finally disappeared from view. Modern astronomers studying the remains of this cosmic event initially thought it was triggered by the merging of two main-sequence stars on the same evolutionary path as our sun. This nova was long referred to as "Nova Vulpeculae 1670," and later became known as CK Vulpeculae. 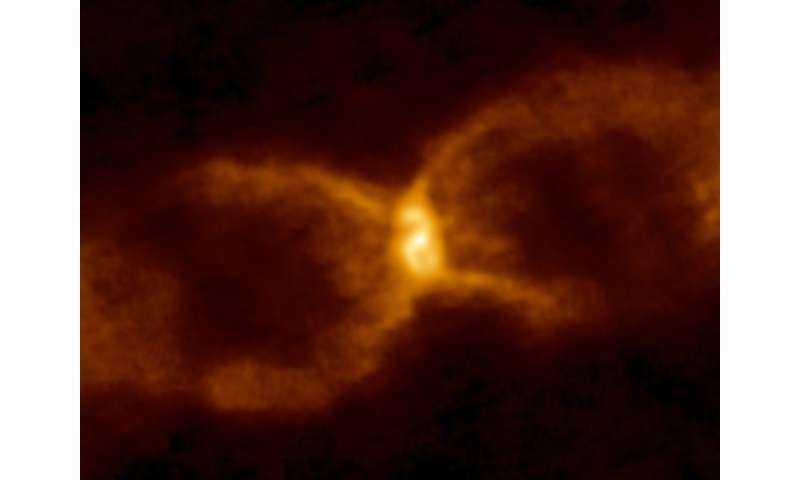 However, we now know that CK Vulpeculae was not what we would today describe as a nova, but was, in fact, the merger of two stars—a white dwarf and a brown dwarf. By studying the debris from this explosion, which today appears as dual rings of dust and gas resembling an hourglass with a compact central object, the research team concluded that a brown dwarf merged with a white dwarf. Professor Nye Evans, Professor of Astrophysics at Keele University and co-author on the in the Monthly Notices of the Royal Astronomical Society, explains, "CK Vulpeculae has in the past been regarded as the oldest 'old nova.' However, the observations of CK Vulpeculae I have made over the years using telescopes on the ground and in space convinced me that this was no nova. Everyone knew what it wasn't—but nobody knew what it was. But a stellar merger of some sort seemed the best bet. With our ALMA observations of the exquisite dusty hourglass and the warped disc, plus the presence of lithium and peculiar isotope abundances, the puzzle fit together: In 1670, a brown dwarf star was shredded and dumped on the surface of a white dwarf star, leading to the 1670 eruption and the hourglass we see today." The team of European, American and South African astronomers used the Atacama Large Millimeter/submillimeter Array to examine the remains of the merger and reported some interesting findings. By studying the light from two more distant stars as they shine through the dusty remains of the merger, the researchers were able to detect the telltale signature of the element lithium, which is easily destroyed in stellar interiors. Dr. Stewart Eyres, deputy dean of the Faculty of Computing, Engineering and Science at the University of South Wales and lead author on the paper, says, "The material in the hourglass contains the element lithium, normally easily destroyed in stellar interiors. The presence of lithium, together with unusual isotopic ratios of the elements C, N, O, indicate that an astronomically small amount of material, in the form of a brown dwarf star, crashed onto the surface of a white dwarf in 1670, leading to thermonuclear burning, an eruption that led to the brightening seen by the Carthusian monk Anthelme and the astronomer Hevelius, and in the hourglass we see today." Professor Albert Zijlstra, from The University of Manchester's School of Physics & Astronomy, co-author of the study, says, "Stellar collisions are the most violent events in the universe. Most attention is given to collisions between neutrons stars, or between two white dwarfs—which can produce a supernova—and star-planet collisions. But it is very rare to actually see a collision, and where we believe one occurred, it is difficult to know what kind of stars collided. The collision here is a new one, not previously considered or ever seen before. This is an extremely exciting discovery." Professor Sumner Starrfield, Regents' Professor of Astrophysics at Arizona State University says, "The white dwarf would have been about 10 times more massive than the brown dwarf, so as the brown dwarf spiraled into the white dwarf it would have been ripped apart by the intense tidal forces exerted by the white dwarf. When these two objects collided, they spilled out a cocktail of molecules and unusual element isotopes. These organic molecules, which we could detected with ALMA, expanded measurably into the surrounding environment, providing compelling evidence of the true origin of this blast. This is the first time such an event has been conclusively identified. Intriguingly, the hourglass is also rich in organic molecules such as formaldehyde (H2CO), methanol (CH3OH) and methanamide (NH2CHO). These molecules would not survive in an environment undergoing nuclear fusion and must have been produced in the debris from the explosion. This lends further support to the conclusion that a brown dwarf met its demise in a star-on-star collision with a white dwarf." Since most star systems in the Milky Way are binary, stellar collisions are not that rare, the astronomers note. Professor Starrfield says, "Such collisions are probably not rare, and this material will eventually become part of a new planetary system, implying that they may already contain the building-blocks of organic molecules as they are forming." When is a nova not a nova? When it is a z-pinched Birkeland current, as imaged above. If the WD had 10 times the mass, I'd say it was less of a collision or merger, and more like an iPhone falling into a lidless blender. I'd like to know what remains of the WD. sorry cant but pushing your little yellow runner ducky around your bathtub is not comparable to the energies released during a tsunami. LOL It sounds almost 'racist'. A brown dwarf was killed by a white dwarf when the brown dwarf accidentally collided with the white dwarf. who then squeezed the brown dwarf' until its innards came out. And furthermore, will they now turn into a black hole? Not enough mass for black hole SEU, or it would have at least turned into a neutron star, which would be the intermediate density form. But I can see the headlines in the science review: "Dwarf on Dwarf violence seen, Brown Dwarf assaults White Dwarf and Brown Dwarf dies in the attempt, White Dwarf wounded and prognosis unknown!" I don't particularly agree with the idea that it had to be a binary that spiraled into each other, it could have as easily been a wandering brown dwarf, as we have seen, end up doing more of a cometary type dive into the white dwarf instead. In fact, that scenario should give the hourglass configuration as well as the obvious ongoing chaos around the remaining white dwarf at the heart of the matter. Agreed. Being that both dwarves were not only of differing colours, but probably also differing in age, the white dwarf may have been the bigger, younger and stronger of the two, which gave it an edge in defeating the brown dwarf and likely assimilating it. The contest seems to have also been a matter of age discrimination as they were apparently unevenly matched, as an older brown dwarf is most often a tad shrunken and had likely lost considerable mass, as you noted. It is a well-known fact that brown dwarves have been seen wandering about in various neighborhoods, attempting to gain entrance into some galaxies. Of course, to be fair, white dwarves also wander about. Also, MACHOs and WIMPs often tangle, but it is yet unknown as to which one comes out as the winner.